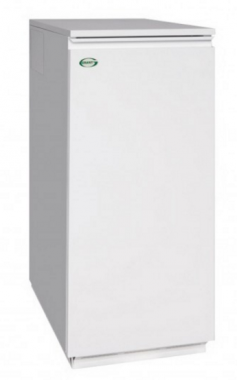 The Vortex Eco Utility 21-26kW Regular oil boiler has been designed and manufactured by Grant to sit in a utility room as a floor-standing unit. It uses condensing technology to deliver a high-efficiency rating of 91.7% which makes it an A rated boiler. This boiler has an output rating of 21-26kW, making the unit perfect for properties that do not have a high demand for hot water. This boiler includes an award-winning condensing heat exchanger, a Riello RDB burner with plugs and socket connections, an internal condensate trap and optional side or rear flue exits. This boiler is extremely quiet in operation so you can be sure that it won't disturb you. This model is also available in outputs between 15-35kW so you can be sure there is a boiler to your home. As a Regular boiler (also known as a conventional or heat only) it will heat your central heating system directly and also produce hot water for a storage cylinder. Due to the fact that you need a hot water cylinder which is fed by a cold water storage cistern located in the attic, this boiler type may not suitable for smaller properties where space is limited. This model includes a 5-year warranty so you can be sure you are purchasing a highly reliable unit that will not let you down.